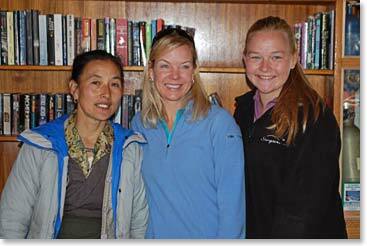 Yangzing, Keely and Alyssa have spent some great resting time together while Scot and his team climbed Island Peak. 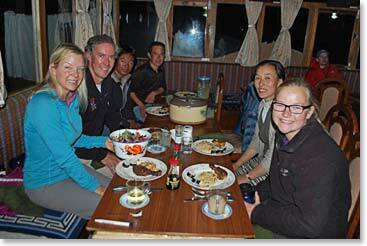 Scot, Sandu and Jeyta were congratulated at Temba’s lodge with a beautiful home cooked meal provided by Ang Temba’s lovely wife Yangzing. 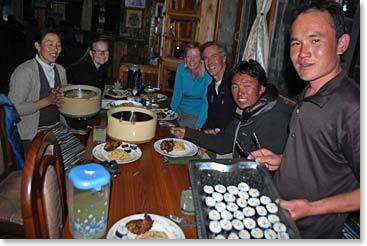 A nice warm lodge and home cooked meals are a welcomed sight for the summit team! 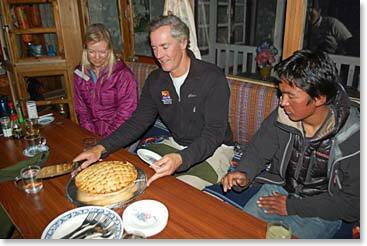 Jeyta is truly amazing; he cooked for the summit team while they climbed Island Peak and even made this apple pie to celebrate with! 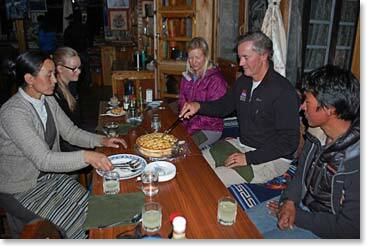 What a great way to end a successful summit of Island Peak and Kala Patar; surrounded by family, friends and Jeyta’s homemade apple pie! For more photos and wonderful stories of the Sellers celebration dinner click here for their family travel blog.